Closest to the door, MarketAsia Distributors were selling Make Magazines, including the latest Vol 30. Singapore Robotic (sgBotic) was also there showing off their products. 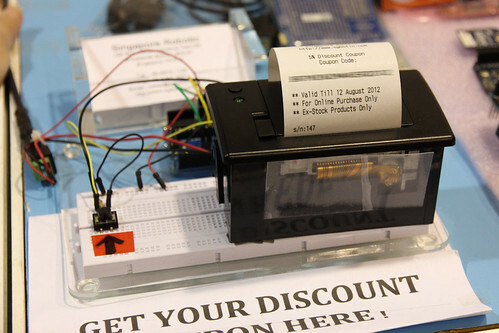 They were using what looks like the Sparkfun thermal printer to print discount codes from an Arduino. I asked them if the printer was for sale and they said maybe soon. Renesas Electronics Singapore was also there, showing off their GR-Sakura board which they hope will replace the Arduino. It’s powered by the RX63N series, clocked at 96MHz. It’s definitely more powerful than the Arduino as it has native USB capability as well as Ethernet connectivity, which looks like it’s connected via an SMSC USB-to-Ethernet controller, just like the Raspberry Pi. As you can see, the board layout looks exactly like an Arduino, and from the overview sheet that I got from the booth, the pins seem to match up. I did inquire at the booth, but the Renesas guy didn’t know if it was the same layout. Stephan February shows off his aquaphonics setup, consisting of plants and fishes (in a barrel below) in a symbiotic ecosystem. The plants get their nutrients from the fish waste, and the waste is broken down before it get back into their tank. 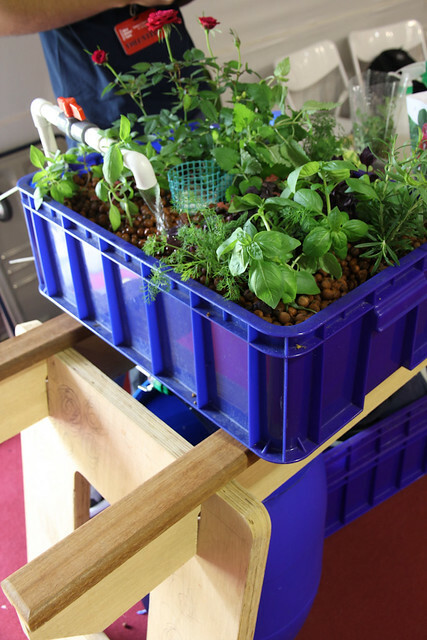 He has a larger set up at home and grows his own vegetables. The Tangible Programming Toolkit is made up of these little cubes which can be easily programmed via a simple GUI. The “program” is uploaded via XBee into these cubes and they can interact with each other. 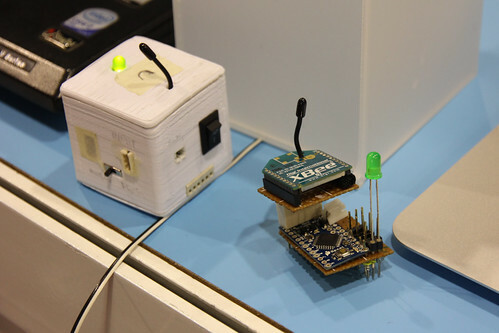 Each cube consists of an XBee with an Arduino Pro Mini. 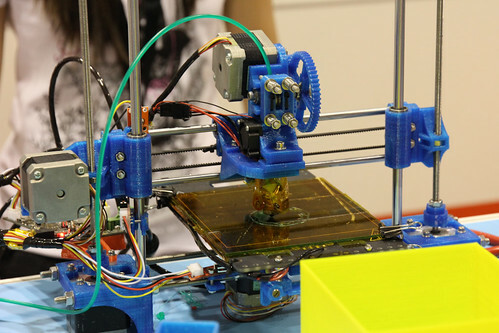 The Portabee is a lower-cost, foldable 3D printer, which itself uses 3D-printed parts. It uses polylactic acid (PLA) instead of ABS for printing. From what I understand, the board design has been tweaked by them. I regret not staying longer, taking more photos and chatting with more of the makers that day. That’s all I have for my tour of the Singapore Maker Faire 2012. There were a lot of booths I did not cover, such as the Dangerous Prototypes booth where they had their Bus Pirate and the Logic Sniffer on display, and there were also several robots for the RoboCup. I saw a tesla coil at Derek Low’s booth, but much to my disappointment he said it wasn’t working. 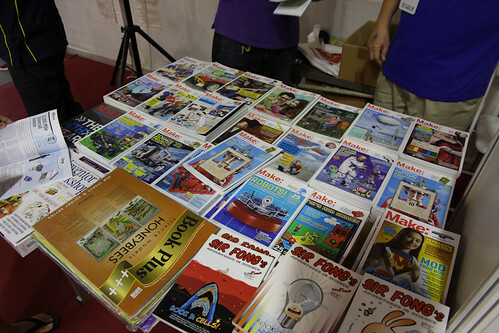 More coverage can be found on the Singapore Maker Faire Facebook page. 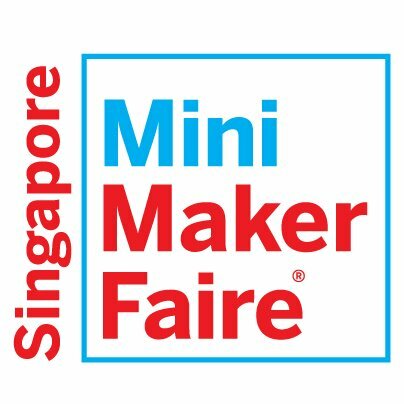 I live in Singapore but only found out about the Singapore Mini Maker Faire 2012 from a DangerousPrototypes blog post. It’s happening this weekend (4th and 5th August 2012) at the Science Centre, 10am – 5pm. Admission charges to the Science Centre applies.